MENOMONIE — Video games, played via television screens, smartphones and computers, are ubiquitous today. They have become so mainstream that UW-Stout and other universities around the country offer bachelor degree programs in game design. In the first half of the 20th century, however, there was no video game industry. How did it grow from late 1800s strength-testers at the county fair to high-tech, animated environments, a $30.4 billion a year industry supporting more than 2,400 companies and 220,000 jobs? Andrew Williams, an assistant professor in the School of Art and Design at UW-Stout, tells the story with his new book, “History of Digital Games: Developments in Art, Design and Interaction.” It was published in early February. “History of Digital Games” was written as a university textbook but could appeal to any game aficionado because it “shows how ideas from the late 1800s are still present in many games of the present,” Williams said. 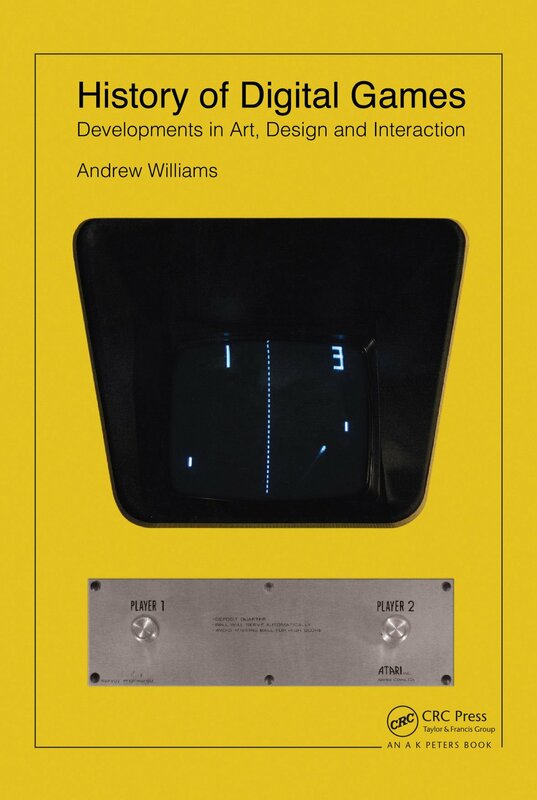 As the subtitle indicates, Williams doesn’t just trace the rise of video games but the interrelationship between game design, art and the development of input devices. His work looks at video games as designed objects and how the design trends were shaped historically, culturally, economically and technologically. “History of Digital Games” is published by CRC Press, an imprint of the Taylor and Francis group, and is available from CRC Press and at Amazon, amazon.com/​History-Digital-Games-Developments-Interaction/​dp/​1138885533. In general, what’s the arc of digital game growth through the decades? The book starts with a discussion of mechanical and electromechanical amusement devices of the late 1800s and 1900s such as strength testers, Thomas Edison’s Kinetoscope, coin-operated sports games and pinball machines. These and other public amusement devices were one of the major sources that helped inform the design of 1970s and 1980s video arcade games. The other major source came from computer hackers of the 1960s and 1970s who created games as a way to understand the capabilities of electronic computers. Forces of commercialization led to games such as “Pong,” “Space Invaders,” “Pac-Man” and “Donkey Kong,” which created sensations in the arcade and provided companies the motivation to develop the home market, further leading to home consoles such as the Atari 2600 and, eventually, the Nintendo Entertainment System. Personal computers appeared simultaneously with these consoles, further expanding the ways that people engaged with video games. The late 1980s and 1990s was a period of rapid advancements as interactive film and virtual reality pointed to the beginnings of a 3D revolution in video games. This momentum, aided by computer hardware specifically designed to calculate 3D objects, eventually enabled the photorealistic imagery seen in many big budget games of the present. The explosion of broadband internet connections and touch-screen smartphones and tablets in the 2000s, meanwhile, provided video games with an even greater presence in people’s daily lives. The 2000s also was noted for the emergence of independent games, which often challenged the assumptions about games and game design practiced by mainstream video game developers. Smaller in scope, often made with a handful of people, and employing a sense of the unconventional, independent games found success that ranged from niche to mainstream audiences. What important discoveries did you make through your research and writing? One of the key narratives I saw emerging from my research was the importance of coin-operated games for developments in home console and home computer games. In addition to porting arcade games to these platforms, arcade games influenced the design of controllers as well as physical hardware specifications. The links between these different contexts is not always made explicit, as arcade games, home consoles and home computers tend to be soloed and looked at separately. Writing a book that provides a general overview of these developments allowed me to better see the links that unify them. How long did you work on the book, and why did you feel it was important to write? The writing process took more than two years, which included conducting dozens of interviews with past and present video game developers, computer hackers of the 1970s and collectors of antique, coin-operated devices. My research also included an even greater amount of reading, as well as visiting one of the largest arcade collections in the Midwest and, finally, playing games with a critical eye. Video games and their history is a new subject of interest in higher education. I saw an opportunity to lend a different perspective to video game history, than that which had been covered before, one that considered games as designed objects and included a broader spectrum of topics. I believe this view highlights the professional nature of game development and can lead to a greater appreciation for the innovative accomplishments of the medium. I was fortunate to be able to meet many wonderful people who helped me in the creation of the book. In particular, James Hague, a professional game designer from video game developer Volition in Champaign, Ill., was key in providing critical feedback during the writing process. Additionally, UW-Stout students Chelsea Bunkelman, Hassan Javaid, Jack Haessly, Maria Kastello, and Keaton Van’t Hull aided in prepping photographs and gathering sources of information.